About two years ago, I had read a short blip on the back page of my quilting magazine and was absolutely fascinated! It is usually a quilt with one single HUGE appliqué on a single color fabric...usually white. It is traditionally cut after a large square of fabric is folded into eighths! Then it is hand appliqued and hand quilted in a echo quilting pattern. My main mission when I stopped by at the Maui Quilt Shop on our vacation was to pick up the throw pillow quilt kit they had available. Little did I know there would be a very generous collection to choose from! I didn't have a lot of time, so I chose mine based on it's colors. I just knew I wanted something that would go in my studio. I then picked up some "local fabric" see HERE. I couldn't leave without a book. I quickly found a pattern book. 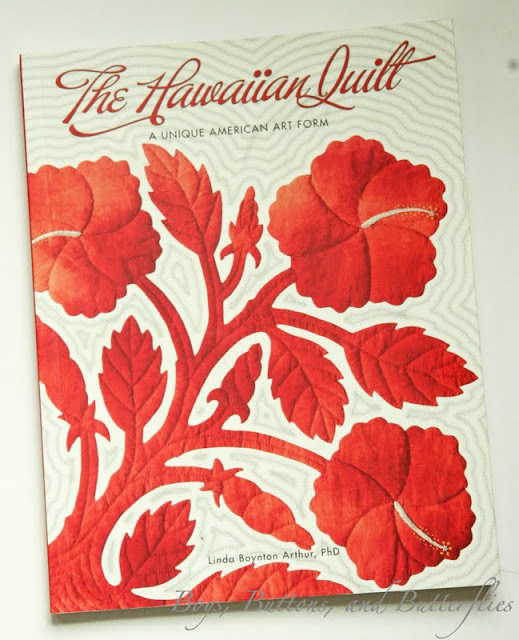 There are over a dozen appliqué patterns and some Polynesian quilting patterns. I was easily distracted. I found myself eyeing this one. As dear hubby can attest, I cannot resist a good book, especially if it involves the history of any crafting. I can read ANY of them over and over. Of course, I dived in as soon as the wee ones fell asleep en route back home. What else was I supposed to do on our nine hour flight other than work on my needlepoint! I had big plans to share the process. Until I read the book. Apparently, it is bad kapu (taboo) to share not only your pattern, but no one is to see the quilt until it is finished. 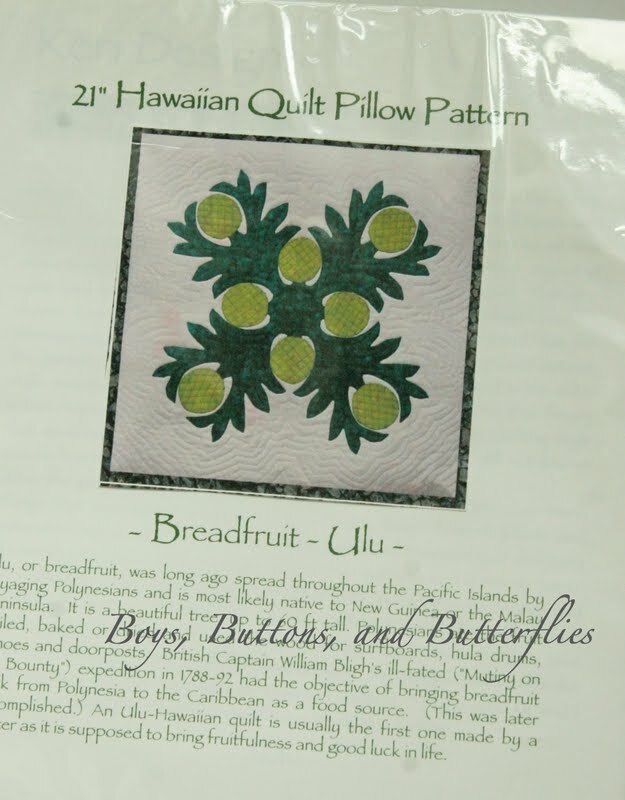 Then, I realized that I had chosen an ulu (breadfruit) pattern. It is said that if you do an ulu quilt first, that you will be as prolific as the plant and will go on to make many more quilts for your family. How is that for choosing the right one in such a quick time?! The other major kapu (rule/taboo) of Hawaiian quilting is that you must "feel right in your heart". So in honor of Pele (the goddess of volcanos), I've decided to share my quilt throw pillow after it is complete. 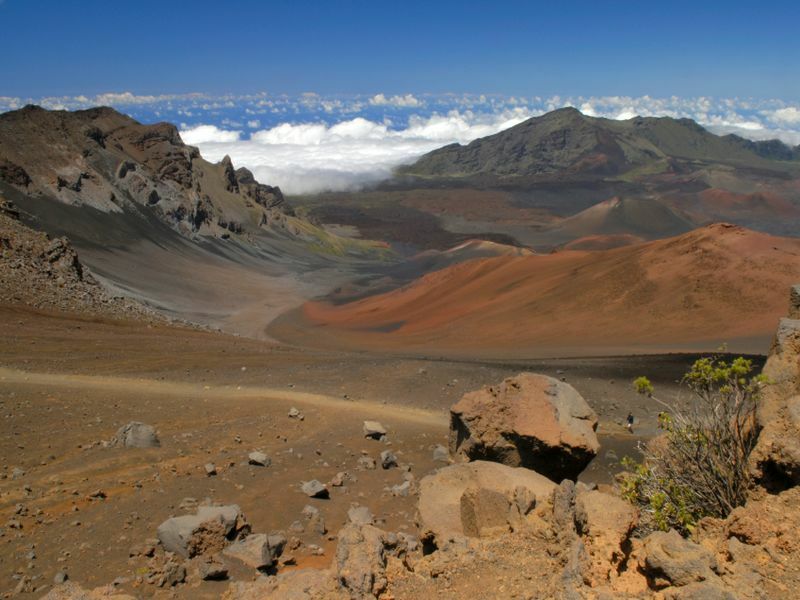 After all, she decided to keep Haleakala quiet during our stay! Borrowed this photo from a Park website. It is the crater of the dormant volcano. It is due to erupt within the next 200yrs. You never know! Those clouds you see in the distance? The day we were there, they were covering us! Wow! I love the history! Now I feel the need to learn more about this. Thanks for sharing! That first quilt is so beautiful. Oh and can't wait to see your finished product! How awesome you picked that quilt!